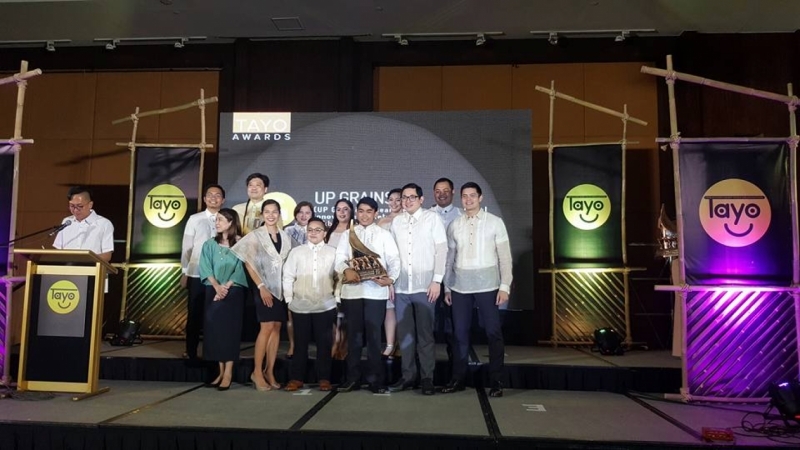 The UP Genetics Research Agriculture Innovators Society (UP GRAINS), a UPLB academic organization for BS Agricultural Biotechnology students, was recognized as one of the country's most accomplished organizations during the 15th Ten Accomplished Youth Organizations (TAYO) Awarding Ceremony on February 22, 2018 at the AG New World Manila Bay Hotel, Metro Manila. The award was given by the TAYO Awards Foundation, Inc., in recognition of the organization's meaningful contribution to society through their Lakbioteknolohiya (Lakbay Bioteknolohiya) project. The organization also received the Lenovo Outstanding Tech Visionary Award during the ceremony. The award is given to organizations whose project addresses societal issues through the innovative use of technology. The conduct of Lakbioteknolohiya stemmed from the organization's realization of the need to rebrand agriculture in a modern way, promote agriculture-related degree programs, and develop appreciation for agricultural sciences. UP GRAINS started conducting Lakbioteknolohiya in 2015 as one of their community service projects. It is a three-day information and workshop series conducted to high schools in Laguna, Batangas, Pangasinan, and Camarines Norte to inform students and teachers of the practical applications of agriculture and biotechnology. Among the topics during the workshop are hydroponics, fermentation, extraction of DNA using household materials, and basic plant disease diagnosis. "It may seem to be very technical but we ensure that these high school students and teachers enjoy learning these new concepts by incorporating and integrating an interactive series of games and activities," said Albert Caraan, project head of Lakbioteknolohiya. For UP GRAINS president Mark Mariano, the conduct of the project not only provides enjoyment to the high school students, but also inculcates the importance of agriculture in nation building. He also said that despite receiving recognition for Lakbioteknolohiya, UP GRAINS will continue to look for ways to improve and expand their project. They are currently eyeing the provinces of Apayao, Bataan, and Iloilo as their next project sites. When asked about his message to other UPLB organizations, Caraan emphasized the value of helping the community. "Gumawa tayo ng activity dahil kailangan ng community. Kailangan nating makatulong dahil sobrang privileged tayo to organize and to create meaningful change in society. (Let us hold activities because the community needs them. We need to help because we are very privileged to be able to organize and create meaningful change in society)," he said.